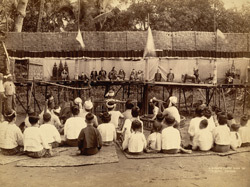 Photograph of a Burmese puppet show, taken by Philip Adolphe Klier in the 1890s. Burmese marionette theatre, known as youq-the or yokthe pwe, is among the most expressive of Burmese artforms. It has a long history, as it is thought to have been well established by the 11th century during the Bagan Kingdom. It flourished under royal patronage, particularly in the late 18th and 19th centuries, but suffered a decline with the fall of the Burmese monarchy and the advent of cinema in the 1930s. Esteemed as a high art form by the Burmese, the marionette theatre went beyond mere entertainment to educate the people in literature, history, current events and religion, and to display lifestyle and customs. The standard repertoire involves a troupe of 28 puppets including royal, courtly and divine characters, nat spirits, mythical animals and types from Burmese life. This view shows the audience in the foreground with their backs to the camera, watching the performance of a line of puppets on stage. In between are a band of musicians, who play a variety of percussion and wind instruments which typically make up an outdoor ensemble. These include bamboo clappers, cymbals, flutes, and drums. The circular frames in which two musicians sit are drum and gong instruments.